Comparing the Mini Cooper S to the Mini Cooper is a bit like comparing a German Shepherd and a Beagle. Sure they’re both cute and you can take them for a walk, but the adorable Beagle will happily trot along attached to its leash while the German Shepherd will drag you across the park if a particular tree smells enticing, leaving you grass-stained and flustered. That’s not to say the base model Cooper performs poorly, quite the opposite actually, but when you add over 50 horsepower to an already competent car, the results are pretty fantastic. The 2008 Mini Cooper S, available in hardtop and convertible form, modifies the Cooper’s formula of classic looks, a low, grounded stance and the ultimate customizable interior by adding more power, more stability and even more excitement. Sounds like we’d all enjoy a good walk in the park with this mean puppy. Go-kart looks and a zippy ride make the average cruise to the grocery store a lesson in how to have fun. Fuel-efficiency – even with the turbocharged engine – bests most cars on the market right now. Customizable interiors and exteriors give everyone exactly the car they want. The never-ending multitude of trimmings makes your little Cooper a pricey purchase. The convertible has a less powerful and less fuel-efficient supercharged engine compared to the hardtop’s turbo boosted inline-four, leaving sun worshippers with a somewhat raw deal. For the 2008 model year, choosing between the hardtop and convertible S doesn’t just involve sun exposure levels; their engines are boosted by a turbocharger and supercharger, respectively, leaving you with very different drive experiences. The turbo can throw you back in your seat, but only when you really stomp on it and the softly whirring supercharger delivers power throughout the power band, albeit in a more controlled fashion. The decreased ride stability found in many convertibles is apparent in the Mini as well, but it is only marginally noticeable thanks to its super-rigid chassis. The Cooper S excels in urban locales; its size makes it easily maneuverable through city streets, where most Mini Coopers spend their time and the sporty multilink suspension softens potholes and bumps effectively. Gearshifts in the CVT automatic are impeccably German – so efficient you hardly notice them - and the manual gearbox lets you milk the engine for all its worth. The Cooper S Hardtop is powered by an impressive 1.6-liter inline four-cylinder turbocharged engine that produces 172 horsepower and 177 lb-ft of torque. The ragtop has a 1.6-liter supercharged OHC transverse four-cylinder engine, giving you 168 horsepower and 162 lb-ft of torque. Both engines are mated to a Getrag six-speed manual gearbox or a six-speed automatic CVT transmission with paddle shifters. The convertible’s sunroof, which opens in just 15 seconds, can be operated with four presses of the unlock button on the key fob before you even enter the car. Not feeling enough get up and go from the base S? Make a checkmark next to the John Cooper Works Tuning Kit option box. This $5,000 package mods your Mini and delivers a heart-jolting 207 horsepower and adds larger brake discs and calipers and a limited slip differential - essentially turning your Mini into a wee supercar. A $4,000 Sidewalk package swaths the interior with English malt brown leather, adds 17-inch wheels and makes the world know it’s a Sidewalk by plastering emblems on the exterior. Mini also throws in four years of complementary roadside assistance for all its cars to seal the deal. With go-kart performance, it helps to have the technology to ensure a zippy, but safe, drive. Cornering Brake Control (CBC) applies pressure to the wheel that needs it most and evens out braking pressure from side-to-side and Electronic Brake Force Distribution (EBD) distributes brake forces to different wheels depending on your Mini's cargo load, giving the Mini more vehicle stability when braking while cornering or during lane changes. The S trims don’t manage quite the amazing mileage that the base versions get, but they’re still the gas sippers we all know and love. The ULEV-II emissions rated hardtop gets 23 mpg city and 32 highway with its auto, while the manual returns 26 city and 34 highway. The LEV-II soft-top doesn’t fare as well, hitting the mileage mark that many mid-size sedans like the Acura TSX meet at 19 mpg city and 29 mpg highway for the auto and 21 city and 29 highway for the manual. The first thing people say when initially stepping into a Mini is always a variation of “There’s so much more room than I thought there would be!â€ Leg and head room is similar to the 20-inch longer VW Rabbit, though rear cargo space with the seats up is less impressive: 5.7 cubic feet compared to the Rabbit’s 15. The interior can become fussy looking as the options list grows – especially on the over the top Sidewalk addition, which we felt took away from the Mini’s much loved utilitarian design. On the convertible, visibility is a big issue with both the top and the rollbar creating big blind spots. The exterior design captures the essence of the Mini, which has rightfully so garnered much attention. Its old school looks have been blended with modern features, including the air intake hood scoop for the S versions and the 16- or 17-inch wheels. Not only do you have an available 10 paint choices, you can also choose from multiple roof designs (for the hardtop, naturally), body stripes and wing mirror colors. The Cooper S has its own niche thanks to its small size and powerful engine, giving it very few direct competitors besides the Volkswagen GTI .The hardtop S starts at $22,600 and the convertible S makes its entrance at $26,050. Other cross-shops are the Mazda 3, Subaru Impreza, Mitsubishi Eclipse, Volkswagen Rabbit, Volvo C30 and Saturn Astra XR. 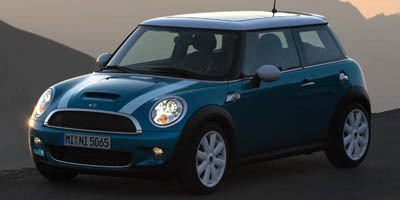 Critiquing the Mini is like an English teacher trying to correct a chapter of Joyce’s Ulysses. It technically can be done, but the little imperfections make the unique product far more fascinating. The Cooper S gives fuel-efficient hatchback enthusiasts a more powerful and sporty version of the car they love. Who would want to mess with that?